ACT Score Range: What is a Good ACT Score? If I had a dollar for every time I’m asked that…well, let’s put it this way: I’d be driving a much nicer car. If you’ve taken the ACT, or you’re planning on taking the ACT, you probably want more information about your scores and what they mean. A good ACT score is the one that helps you get into the college of your dreams! For most students, scoring above average, 21 or higher, is a good ACT score. For those applying to elite colleges, scores in the 94th percentile (30+) or even the 98th percentile (33+) are good ACT scores. But that’s the short answer… there is more to it than that of course. ACT scores range from a low of 1 to a max score of 36. Overall, ACT test scores are the average of test-takers’ sectional scores (also 1-36) in English, Math, Reading, and Science. So what is a good ACT score? The ACT score range for students admitted to different colleges varies, and the average ACT score is 20.8. However, various factors will affect what a “good” ACT score is for you. Where do you stand in terms of the ACT score range? And where do you stand in terms of the ACT score range for colleges you might want to attend? While a lot of people might cop out by saying no, I’ll take a risk here and say YES—with a big caveat. A “good” ACT score depends entirely on your personal goals. Does better than average count as good? Top quarter? Top 10%? All of these thresholds are meaningless without context. In fact, there are about as many different “good” ACT scores as there are ACT scores. And a good ACT score for someone else might not be a good ACT score for you. Furthermore, while most schools care about the composite score, some will look specifically for your subject area scores. So even a number isn’t just a single number. Don’t worry, though. We’re not going to leave it at that! In fact, we’re going to dive in and look at every factor that affects how good your ACT score is for your personal goals. What Is the ACT Score Range? What Is the ACT Test Score Range for the Top 100 U.S. Universities? What Are Good ACT Scores for Sophomores, Juniors, and Seniors? What Is a Good ACT Score for Scholarships? What ACT Score Range Do I Need for the Ivy League? What Is the Pre-ACT Score Range? How Can I Improve My ACT Test Scores? Diagnostic Quiz: How Will You Score on the ACT? Within each of the four tests, you’ll receive a scaled score from 1-36. The test maker then averages your four test scores for the composite, or overall, score. This is also scored using the 1-36 score range. So what is a good ACT composite score? The lowest composite ACT score possible is 1, while the highest ACT score possible is 36. Other factors will help you determine what a good ACT composite score is for you, and we’ll look at those in a minute. But the composite score is not the only score that matters! ACT score reports will provide you even more information about your test-taking experience in the form of sub-scores. What do these look like? We’re so glad you asked! Science 1-36 No sub-scores on the Science test! Finally, last but definitely not least, you’ll see your percentile. Or, rather, percentiles. Your ACT percentiles compare your scores to the scores of other test-takers. When you get your score report, you’ll be able to see where you stand both in terms of your composite score and your test (or in-section) scores. If you scored in the 90th percentile, for example, you scored better than 90% (or 90 out of every 100) test-takers. If you scored in the 50th percentile, you scored better than half of your peers. But even with ALL of the information you can find on your ACT score report, your ACT test scores still don’t mean that much without more context. As I emphatically stated at the beginning of this post, a good ACT score for you will depend on what your goals are. Well, here’s a chance to see how to tailor those goals to the school(s) of your dreams before you send ACT scores to them. How Do Colleges Use the ACT? The ACT, like its cousin the SAT, is a standardized test meant to measure both knowledge gained in high school and potential to succeed in a college setting. The higher the score, the more likely a student will excel in college. Though not the only piece in the college application puzzle, your ACT score is the first thing most admissions counselors see. If you don’t score in the same range as most of the current students, it is going to be VERY HARD to convince them that you would be the perfect fit. In the table below, you’ll see the 25th-75th percentile ACT scores (also known as the “middle 50%” scores) for the top 100 U.S. universities. What do all those numbers mean? In short, the middle-scoring 50% of incoming students scored within this range. 25% of incoming students scored below the lower number, while 25% of incoming students scored above the higher number. Everybody else (the middle 50%) scored between the two. With all that said, take a look at the ACT score range in 2016 below. Data from the U.S. News & World Report: National Universities Ranking. Just make sure that you’re using the information appropriately. We provide the middle 50% ACT test scores for a reason. Hold on, there, buddy. Yeah, Harvard isn’t lying when it tells you that someone with a 22 got it. Yet he (or she) was an exception to the rule. Maybe she got a medal in the last Olympics. Maybe his father is an alumnus with a fat (and generous) wallet. We can’t know for sure, but it doesn’t really matter. What you need to do is make sure that you use the best info available—and in this case, it’s those middle 50% test scores. There are no ACT score requirements for Harvard, but 75% of admitted students do score above 32 on the ACT. However! I’m not saying that falling below an ACT score range means that there is a 0% chance you’ll get into your dream school. Some people do, or there wouldn’t be a range. So by now you know that the ACT score range is 1-36, and that 36 is the perfect ACT score. You also have some idea of where you’ll need to score to get into your dream school, as well as where you’d be likely to score if you took the test today. But where do you stand compared to the average test-taker? The ACT average score was 20.8 (composite) in 2016. Basically, if you scored above 21 overall, you’re ahead of the curve. To see how far ahead of the curve you are, or the points you’d need to score to reach 21, looking at ACT percentiles is a good place to start. It can also be helpful to look at the ACT in comparison to other standardized tests, particularly the SAT, to see how your score stacks up. If you’re feeling super competitive, you can also check out how your score compares locally in Average ACT Scores by State. The average ACT composite score of 20.8 reflects the average overall score on the ACT tests. Let’s take a look at how this breaks down for each of the four tests and the essay (which isn’t factored into your overall score) on the following ACT score chart. What is a good ACT Writing score? A quick note on this essay business. You might be worried about the ACT essay, as the scoring has recently changed. But there’s nothing to fear! Actually, the scores have just reverted to the old ACT score range for essays of 2-12. When considering the questions, ”What is a good ACT score for a sophomore,” “What is a good ACT score for a junior,” and “What is a good ACT score for a senior,” things get a little more complicated. Now, in addition to the factors we’ve already discussed, we’ll add in one more: grade level. This will help us pinpoint a good ACT score range for you to target depending on your circumstances. After all, what is considered a good ACT score for a sophomore (and maybe taking the PreACT) won’t be the same as what is considered a good ACT score for a senior. Okay…So What IS Considered a Good ACT Score? We’ve crunched some numbers and come up with the following, based on your ultimate goals. The numbers on the ACT score chart are loose projections—as I mentioned earlier, students with lower scores may still get into their dream schools! Still, these scores are good/great starts for students at different grade levels with the following goals. Only Ivy League for me! Keep in mind that we constructed this table with the assumption that you’ll keep studying and pushing yourself in your ACT prep as you move through high school! On the other hand, if you’ve scored a 36 and you’re a sophomore, that’s awesome. Don’t take the test again. Also, what are you still doing reading this post? Imagine this: It’s test day, and you’ve finally finished taking the ACT. The proctor calls “pencils down!” You turn in your test, walking out of the room with a sense of accomplishment, pride…and potential fistfulls of dollars. Yup, a strong ACT score can put you in the running for scholarships. But just what is that strong (okay, okay—”good”) ACT score for scholarships? As with ACT scores for college admissions, there’s no one magic number. On the other hand, there are a few guidelines we can look at. Is My Score in the Ballpark for ACT Scholarships? If you’re scoring in the 30s, that’s a great place to start. After all, if you score above 30, you’re in the top tenth percentile of all ACT test-takers. On the other hand, you can still get a scholarship even if you’re scoring in the mid-20s. The main variables here? Which scholarships you’re applying for, and which schools you hope to attend. In almost every case, the higher your score, the bigger the payout. Baylor University gives scholarships of up to $41,996 a year to students getting a perfect score of 36 on the ACT. But knock that score down a few points, to 29, and suddenly that scholarship’s only $27,996. Oklahoma State University gives students scoring 24 on the ACT (and a 3.0 GPA) up to $7,000 a year. Six points more, though, and students scoring 30 are eligible for up to $12,500 annually. As we’ve seen, some scholarships will also have GPA requirements, or applications, so be sure to check before assuming that money’s in the bank. Kristin breaks this down further for us, explaining what these scores mean. If you’re wondering about the relative “value” of the SAT vs. ACT in Ivy League admissions, she does a great job of explaining that, as well. Final word? Remember that, when applying to the Ivies, it’s important for your whole application to, well, sparkle. If you’re scoring slightly below the middle 50% for your dream Ivy, it’s worth putting in the time to pull it up. Maximize those chances! You’re only taking the ACT Aspire. Now, let’s go into these scenarios in greater detail. You’ve decided to forego the Pre-ACT and ACT Aspire tests in favor of the ACT. I definitely don’t recommend useless extra testing, but if you’re offered the opportunity to take both these tests before the real ACT, it’s a good idea to do so. You’re probably in tenth grade or younger, and most likely won’t have covered all the coursework that the ACT tests. By taking the Pre-ACT, you’ll be able to see the ACT range that you might hit, as well as areas that you can work on before the official test. The 9th and 10th grade Aspire tests will also help you sharpen those test-taking skills. Colleges won’t see these scores, so it’s great to get a sense of your weaknesses under exam conditions before your official exam. You’re taking both the Pre-ACT and the ACT Aspire, just the Pre-ACT, or just the ACT Aspire. First of all, make sure you know exactly what you’re taking! Sophomores can take both tests, but they’re scored very differently. The Pre-ACT is scored on the same 1-36 ACT score scale. This means that you can use the above guidelines to see approximately where you’re scoring within your peer group. On the other hand, the ACT Aspire uses “benchmark” scores in the triple-digits. Meeting the benchmark scores is one way to predict success in first-year college courses. ACT Aspire does not use the same format or scoring as the ACT, but it can be really helpful to see where your scores are weaker and where they’re stronger, because guess what? The ACT Aspire tests the same subject areas as the official ACT. And, in fact, the 9th and 10th-grade ACT Aspire test predict how you’ll do on the ACT in 11th grade in terms of the benchmark scores. Wondering what those benchmarks are? We’ve broken it down for you below in the ACT score chart, and you can check out “What Is a Good ACT Aspire Score?” for more details. Data from Discover ACT Aspire. Because we’ve been looking at general ACT scores, on the 1-36 scale, it can be helpful to have a rough conversion between the ACT Aspire and general ACT scores, as well. As always, we’ve got you covered! Data from ACT Aspire: Predicted Scores. Whether you have a few years or a few days before you take the official ACT, several resources can really help you on your way! By going through the Magoosh ACT Blog, you can also use these resources to make a study plan, get great advice, and get detailed practice questions and explanations from our experts. If you’re looking for one-stop shopping for your ACT prep, this is it. Even if your test is this weekend, it’s a really good idea to familiarize yourself with the test format and question types you’ll see. This will allow you to spend time actually answering questions, rather than figuring out what you’re supposed to do, during the test! Magoosh even offers a free, printable ACT Practice Test with over 200 of our student-tested ACT questions, as well as answers and explanations. And if you’re just beginning your prep, this is still the best place to start. Once you’ve taken the test, you can analyze which areas need the most improvement and then strategize your study plan. 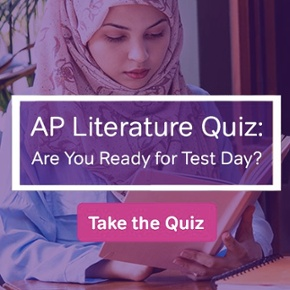 Finally, keep in mind that if you take the ACT in December, April, or June, you have the option of signing up for the Test Information Release service, which will provide you with a copy of the test questions, your answers, and the answer key. This can provide you with an incredible amount of information to help you prepare to do better on a retake. A Final Word: What IS a Good ACT Score? So what IS a good ACT score? It’s the score you’re happy with, because it’s the score that will take you where you want to go. Whew! Good job, guys. 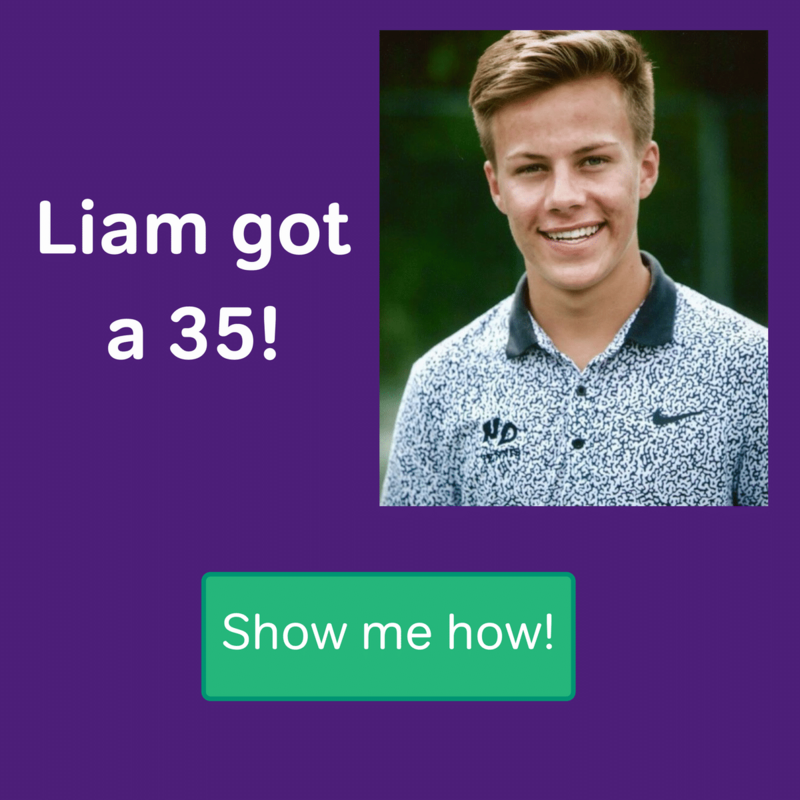 As a reward for sticking it out and filling your head with all kinds of useful ACT information, check out how your ACT scores compare to those of famous people, and get the definitive answer to those eternal questions: Are you more of a Barack Obama or a Marilyn Monroe? Peyton Manning or Sonia Sotomayor? Now you’ll know. 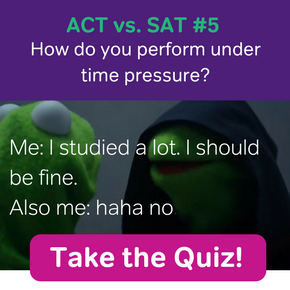 Quiz: How Will You Score on the ACT? Wondering how well you would perform on the ACT if you were to take it today? At the start of your ACT prep journey, it’s important to establish a baseline—that way, you know how much you need to improve before test day and you have a way to measure how well all your studying has paid off. The absolute BEST way to measure how prepared you are for the ACT is to take a timed, full-length practice test and see how well you score under test-like conditions. But, since you probably don’t have 3-4 hours to spare right this minute, let’s start with a 12-question quiz. This quiz has one page for each ACT test (4 total): English, math, reading & science. Each section has 3 questions: 1 easy, 1 medium & 1 hard (in that order). Coca-Cola history began in 1886 when the curiosity of an Atlanta pharmacist Dr. John S. Pemberton, led him to create a distinctive tasting soft drink that could be sold at soda fountains. He created a flavored syrup and took it to his neighborhood pharmacy, where it was mixed with carbonated water and deemed “excellent” by those whom have sampled it. Dr. Pemberton’s partner and bookkeeper, Frank M. Robinson, is credited with naming the beverage “Coca‑Cola” as well as creating the design of the trademarked, distinctive script that is still used today. The first servings of Coca‑Cola were sold for 5 cents per glass. During the first year, sales initially averaged a modest nine servings per day in Atlanta. Today, daily servings of Coca‑Cola beverages are estimated at 1.9 billion globally. In 1888, Dr. Pemberton sold portions of his business to various parties, just two years after creating what was to become the world’s #1-selling sparkling beverage however only a few years before his death. The majority of the interest was sold to Atlanta businessman, Asa G. Candler. Under Mr. Candler’s leadership, distribution of Coca‑Cola expanded to soda fountains beyond Atlanta. In 1894, impressed by the growing demand for Coca‑Cola and the desire to make the beverage portable, Joseph Biedenharn installed bottling machinery in the rear of his Mississippi soda fountain, becoming the first to put Coca‑Cola in bottles. The three entrepreneurs purchased the bottling rights from Asa Candler for just $1. Benjamin Thomas, Joseph Whitehead and John Lupton developed what became the Coca‑Cola worldwide bottling system. Large scale bottling was made possible just five years later, when in 1899, three enterprising businessmen in Chattanooga, Tennessee secured exclusive rights to bottle and sell Coca‑Cola. He created a flavored syrup and took it to his neighborhood pharmacy, where it was mixed with carbonated water and deemed “excellent” by those whom have sampled it. Dr. Pemberton’s partner and bookkeeper, Frank M. Robinson, is credited with naming the beverage “Coca‑Cola” as well as creating the design of the trademarked, distinctive script that is still used today. In 1888, Dr. Pemberton sold portions of his business to various parties, just two years after creating what was to become the world’s #1-selling sparkling beverage however only a few years before his death. B) portions of Dr. Pemberton’s business were sold to various parties, creating the world’s #1-selling sparkling beverage just a few years before his death. C) the world’s #1-selling sparkling beverage was created after portions of Dr. Pemberton’s business were sold to various parties just two years later but only a few years before his death. D) only a few years before his death and just two years after creating what was to become the world’s #1-selling sparkling beverage, Dr. Pemberton sold portions of his business to various parties. Solve the problem and then choose the correct answer. You may use a calculator on the ACT Mathematics Test. The expression log3(63) + log3(5) – log3(35) equals which of the following? Read the following passage, then answer the questions below. You may look back at the passage as often as you’d like. Edmund Burke, the British writer of political theory, believed government had been improved by every preceding generation up to his own. He saw the successive effort of early Greek democracies and Byzantine emperors and the rules set forth by the Magna Carta coalescing into a consummately effective—though far from perfect—society. In his eyes, the British Parliamentary system of his day represented the realization of all of the efforts theretofore drawn together by the work of Enlightenment philosophers in the 18th century. It was the fullest expression of liberty balanced with order yet known to man. A deep sense of gratitude to his forbears reigned in every word from his lips and from his pen. Due to this national pride and patriotism, Burke’s dismissal of the French Revolution brings little surprise to the student of history. Yet, his positive attitude toward the American Revolutionaries, so uncommon in his time and station, was no less a natural expression of his political stance. Years before the fateful July fourth, Burke addressed the British House of Commons regarding the trouble stirring far across the Atlantic. The British had treated the American Englishmen unjustly, he argued. Taxation without representation violated the principles foundational to Parliament. Taking a long and careful view of history, Burke believed that the colonists had both tactical and ideological advantages; they wielded the two-edged sword of power and virtue. As long as the English people exploited their overseas brethren, they could not hope to suppress the colonists with violence. Burke’s call to action went unheeded, and the American Revolution began. Still appealing to his perennial belief in the superiority of the Parliamentary system of government, he pled with the House, “As long as you have the wisdom to keep the sovereign authority of this country as the sanctuary of liberty, the sacred temple consecrated to our common faith, wherever the chosen race and sons of England worship freedom, they will turn their faces towards you. The more they multiply, the more friends you will have; the more ardently they love liberty, the more perfect will be their obedience. Slavery they can have anywhere. It is a weed that grows in every soil. They may have it from Spain, they may have it from Prussia. But, until you become lost to all feeling of your true interest and your natural dignity, freedom they can have from none but you.” Despite his wise words, the English still sought to enslave the colonies, thereby losing America. A) Burke still believed Parliament was an inherently good institution. B) Parliament had ignored Burke’s previous appeals. C) the American colonies would find another nation to govern them if Parliament pulled away its support. D) Parliament was too entangled in the slave trade to maintain relations with America. 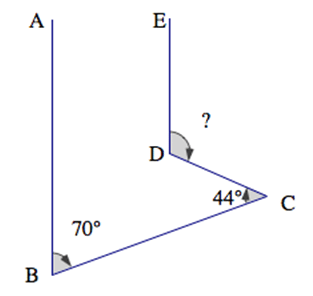 Read the passage and review the figures, then select the best answers to the questions below. You may refer back to the given information as often as you need. Calculators are not allowed on the ACT Science Test. Malaria is an infectious disease that kills more than 600,000 people every year. Several species of the genus Plasmodium cause malaria, with two of the most common being Plasmodium falciparum and Plasmodium vivax. 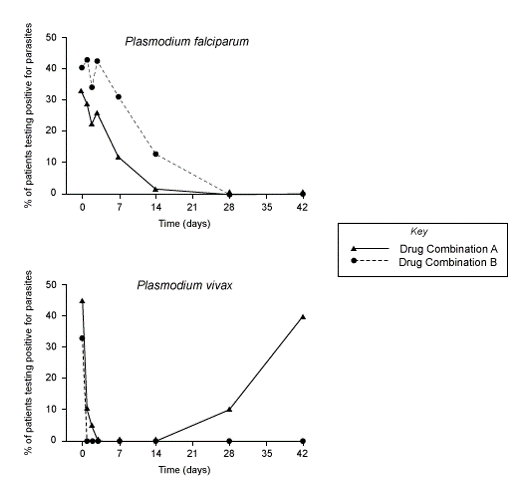 Though both species cause a very similar illness, P. falciparum malaria is more likely to result in fatalities than P. vivax malaria, while P. vivax malaria is more likely to recur—to return after a period of time during which the patient is healthy and has no parasites present in the blood. The two species of malaria parasites respond differently to antimalarial medications, but in many areas where malaria is common, testing to determine what type of malaria a patient has is not widely available. Therefore malaria treatments are often tested against both species of the parasite, and first-line malaria treatments in these regions ideally should be effective against both parasites. For many years, public health professionals in Papua New Guinea have recommended a treatment regimen, Drug Combination A, as a first-line malaria treatment. Recently a new treatment regimen, Drug Combination B, has been proposed as a potential replacement for Combination A, and a study was conducted to compare their effectiveness. Children entering a local health clinic with malaria symptoms were tested to determine which Plasmodium species they carried. The patients were then randomly assigned Drug Combination A or Drug Combination B, and their blood was tested periodically for the presence of parasites. On rare occasions, patients have severe allergic reactions to a compound that is found in both Drug Combination A and Drug Combination B. In these cases, a second-line treatment must be used. A second study was conducted to determine which of several drug combinations would be the best second-line drug to recommend for use in Papua New Guinea. Table 1 shows the treatment response to the second-line drug combinations. A) 1% for patients treated with Drug Combination A, 12% for patients treated with Drug Combination B. B) 12% for patients treated with Drug Combination A, 1% for patients treated with Drug Combination B. C) 7% for patients treated with Drug Combination A, 14% for patients treated with Drug Combination B. D) 0% for both drug combinations. Suppose a patient is brought to the clinic with a life-threatening case of P. falciparum malaria. As the patient’s condition is deteriorating quickly, it is essential that they be given the treatment that eliminates parasites from their blood within 7 days. Based on the data from Experiments 1 and 2, which treatment should they be given? Drug treatments that are eliminated from a patient’s body very quickly are likely to result in recurrence of P. vivax in the patient. Based on the information in the passage, which of the following drugs is likely NOT removed from the body quickly? If your results don’t match your expectations, remember that it is definitely absolutely 100% possible to boost your score before the official exam! It’ll just take some dedicated prep time, some good materials, and a solid plan. Sign up for a free 7-day trial of Magoosh ACT prep to get access to over 200 lesson videos, 700 practice questions, and 3 full-length practice tests. On the other hand, if your results reflect where you want to be, that’s a great start! But keep in mind that there are a lot of variables that can affect your test score. Taking a few full-length practice tests before the official ACT exam, reviewing your answers, and studying your weak areas, will ensure that you get the score you want when you sit down to take the real ACT. Should I Send Both SAT and ACT Scores to Colleges? What Is a Good PreACT Score? would you consider that is good for his grade. Because your son is still two years away from high school, these are reasonably good scores for early ACT practice. Still, you are right that it may be a good idea for your son to work on his ACT Reading skills as he gets older and heads into high school. Hi, I’m a junior in high school. I just recently took the ACT and I am wondering if my score was good or not considering my grade and future college applications. I got a 23 composite. 21 on math. 22 on science. 30 in English. 20 in reading. and 8 in writing. I would appreciate your insight. Hi, I just finished my junior year and I got a 34 composite with 32 Englis 33 reading 35 math and 36 science. My dream school is MIT. Is it better to retake the test it leave it as is and focus on other things? Top 25 or Ivy League school? And should I consider taking the writing portion of the ACT as I haven’t before? Interesting question! The answer really depends on why you are taking the ACT. Many 7th graders take the ACT in order to participate in talent searches and enroll in programs for academically gifted students. If that is the case for you, then a “good” ACT scores is the one that qualifies you for these programs! Our website mainly focuses on taking the ACT for college, but this website has some good information about average ACT scores for these sorts of academic programs. If you want to take the ACT just to get a feel for the test and understand your personal strengths and weaknesses, then this ACT report might be helpful for you! It’s got some pretty complex statistics, but the most important thing to note here is that students who scored a 12 in 7th grade got the average ACT score (21) in their senior year. The students who scored 20 or higher in 7th grade earned a 30 or higher as seniors, and those who scored 28 or higher in 7th grade scored a 35 or higher as seniors. So, if you have an idea of what score you want as a senior, you can estimate your target score as a 7th grader! Keep in mind that nothing is set in stone, however; with practice and study, you can improve your ACT score beyond what this study says! You should keep your expectations realistic as a 7th grader; you probably haven’t learned everything that is on the ACT yet, so it’s unlikely that you will get a top score. However, if you take the time to learn about the test and learn from your mistakes, this can be a valuable learning opportunity for you! 33 Englis 36 reading 25 math and 30 science. but my Weighted gpa is 3.6 . I am planning to major CS . How does my low GPA affect my admissions . I was just wondering if it’s possible to pair an ACT composite from one test date (ie, July) with an ACT writing score from a different test date (ie, December). I got a 33 composite on the July ACT (7/14) and a 12 on writing from the December ACT. I wanted to pair these together for college applications. Is this possible? Thanks in advance for the help! Some universities do accept ACT scores in the way you’re describing. This option, when it’s available, is called “superscoring.” If you want more info n this option, you can read Rachel’s article on ACT superscoring.